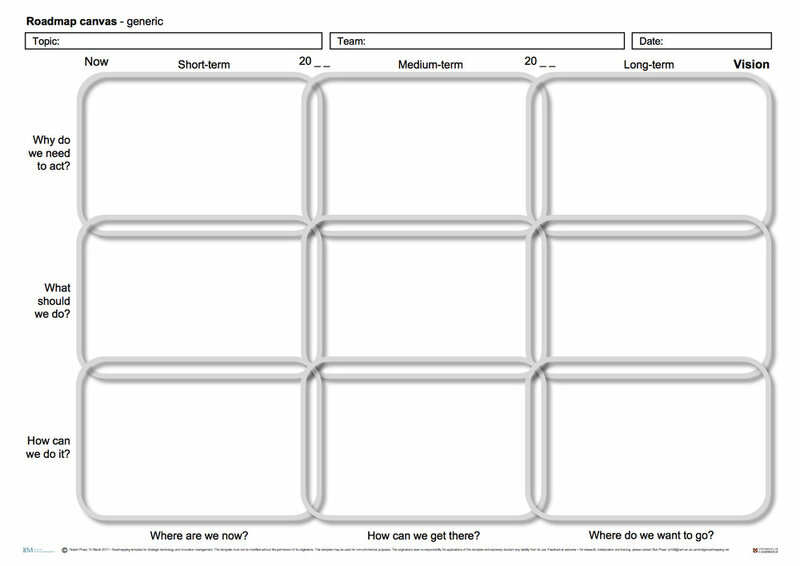 1) Roadmapping roadmapping (R2) template, to support review, planning and strategy for roadmapping initiatives. 2) Business model transformation, illustrating two ways of integrating the business model canvas into roadmapping templates. 3) Strategic technology and innovation management (STIM) toolkit, comprising four templates for general business application. 4) Sunshine chart, a roadmap template configured using polar coordinates. 5) Strategy map and balanced scorecard template, integrating Kaplan & Norton frameworks with roadmapping. 6) EFQM template, to support EFQM Excellence Framework through integration with roadmapping. 7) Value chain template to integrate Porter's value chain framework with roadmapping. 8) Emerging technology roadmap templates, for mapping technology-intensive industrial emergence. 9) Roadmapping change template, emphasising how roadmap structure supports change management. 10) Generic roadmap template, for general strategic application. 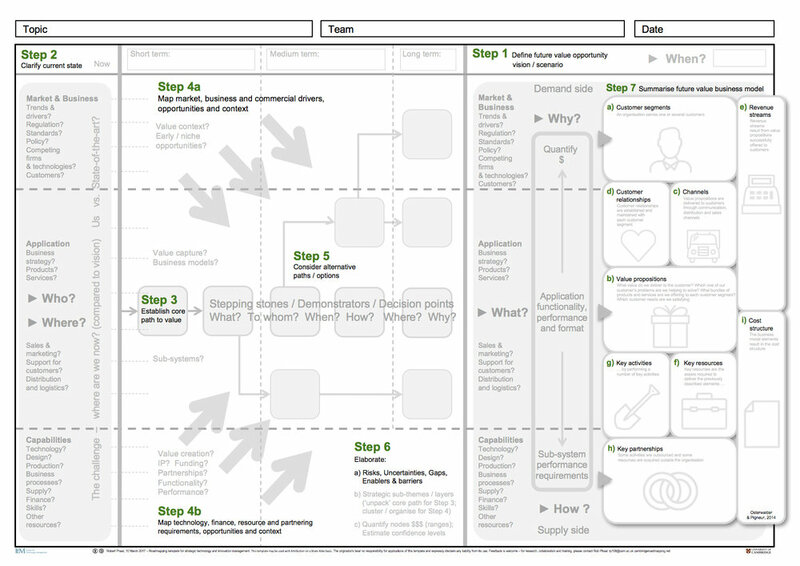 11) Agile roadmap template, for strategic innovation planning. 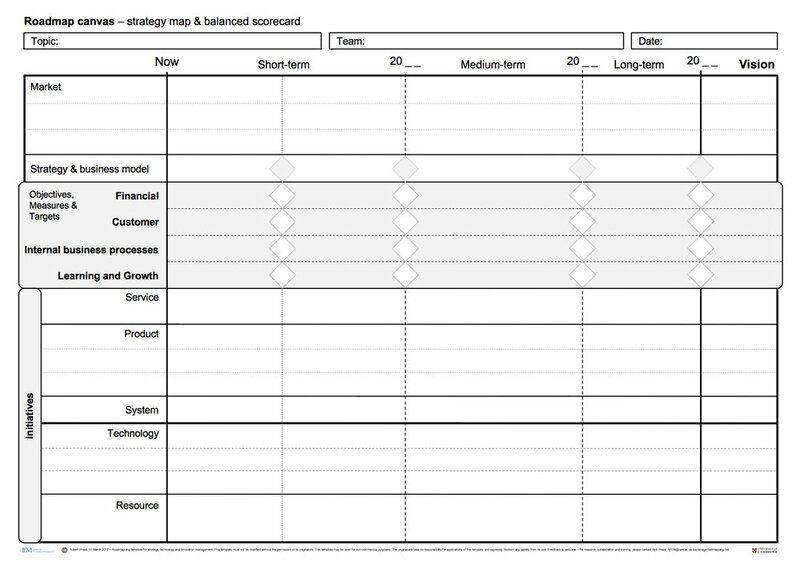 12) Product-technology roadmap template, for strategic innovation planning. 13) 'Push-me—pull-you' linking grid template. 14) 7 Ps marketing mix roadmap templates. 15) Scenario development template for exploring future uncertainty. A working paper on template design and application is available here. There are various approaches to tool and framework integration with roadmapping to create toolkits, including: 1) Sequential, with tools separated, performing different functions within a process, which may include feedback loops and iterations, with the roadmap often as a hub and data alignment in terms of inputs and outputs; 2) Embedded, with other tools included in the roadmap 'canvas' as process sub-steps; 3) Integrated, with elements of other tools incorporated into the roadmap structure and process, or vice-versa, to a greater or lesser extent. Whilst off-the-shelf 'vanilla' templates such as those provided here can be useful, specific contexts vary considerably and templates should be applied with caution and in a non-prescriptive manner until utility is demonstrated - caveat emptor. Consider these templates a starting point (which may be sufficient), with the template (tool) structure along with the content (strategy) refined through iterative 'rapid prototyping' applications, as necessary. The process of template design is helpful in itself, to clarify language, structure and process when designing a workshop, and template creation need not take long if the context, purpose and process are clear. Process guidance on template use is not currently provided here, apart from the 'self-facilitating' templates that incorporate process prompts. Templates can be used in various ways, and there are many design options and aspects to consider for specific applications and contexts. The templates available here are experimental in nature, and are subject to change. Forms for assessing template utility are provided, with the working paper providing a reference point. Feedback on templates and their use is welcome for research purposes, and to improve the resources provided here - please contact me if you have any queries. All data received will be treated in strict confidence, and anonymised for any subsequent publication. Templates may be used freely without alteration for non-commercial purposes (i.e. not for paid consulting). Internal application by firms within their own organisation is not considered to be commercial in nature (i.e. not associated with paid consulting); if in doubt, or to discuss commercial applications or licensing, please email Rob Phaal. Roadmapping is a very flexible technique, and can even be applied to itself. This may sound strange and recursive, but roadmapping is an ideal way to clarify strategy, plans and resources for roadmapping initiatives, or any other business process or system. A workshop template for supporting this has been refined and tested as part of the 2017 STIM Programme. A form for assessing template utility is provided - feedback on the template and its use is welcome. Please email Rob Phaal if you have any queries. Business models are a popular topic in management, research and consulting, with Osterwalder & Pigneur's Business Model Canvas and Gassmann & Frankenberger's Business Model Navigator useful for understanding the components and building blocks of business models. However, as with most strategy tools, they are rather static in that the time dimension is not explicit, which can be readily addressed through integration with roadmapping. An early integration with the business model canvas was observed in 2010 (Ikerlan, Spain), where the canvas building blocks were configured as layers within a broader roadmap structure, providing context for the business model perspective - along the lines of the experimental template below, aligning transformation goals with the activities required to achieve them. With the time dimension explicit, it is possible to consider development, change, evolution, disruption, convergence and transformation of systems including business models, with the integrated roadmap used to support synthesis and planning as the final step of a strategic innovation project. Feedback on these templates and their application is welcome, with a feedback form provided to assess utility. Please email Rob Phaal if you have any queries. 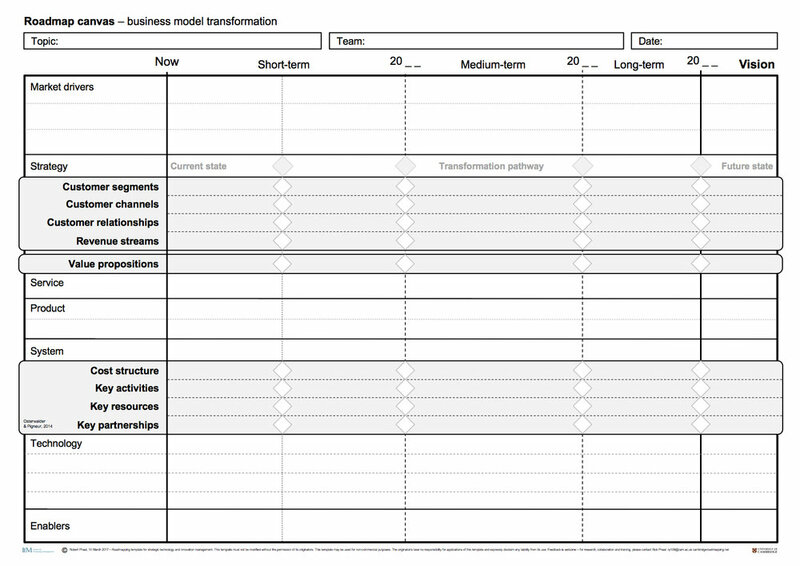 In the experimental template below (based on the 'new' template here) the business model canvas is embedded as the final step of the process, to summarise the future state business model. This template is not considered to be the general case - for example, it may be appropriate to start with the canvas, to set the vision or establish the current situation, goals and way forward in more concrete terms. A sequence of four aligned templates (toolkit) is presented here, with deployment in a visual management room in mind, for supporting strategic technology and innovation management. These are experimental in nature, and a form for assessing template utility is provided - feedback on the templates and their use is welcome. Please email Rob Phaal if you have any queries. The data relationships between these tools is illustrated below, together with the proposed process, emphasising a lean, agile, visual human-centric approach, which can be enabled and enhanced by appropriate digital technology. Templates are designed to align so that they can be set out along a wall as a toolkit, as illustrated below. Note - template sequence does not imply process sequence, which can vary considerably and may be iterative - see Kerr & Phaal (2015) for more information on tool sequencing. This template is similar to the roadmap in the toolkit above, set out using polar coordinates rather than cartesian. The origin of this format is not clear (quite possibly independent of roadmapping) - sometimes called a sunshine chart or (generally ‘digital’) transformation map. This template is experimental in nature, and a form for assessing template utility is provided - feedback on the template and its use is welcome. Please email Rob Phaal if you have any queries. Kaplan and Norton's balanced scorecard and subsequent strategy map approaches are well-known and established. 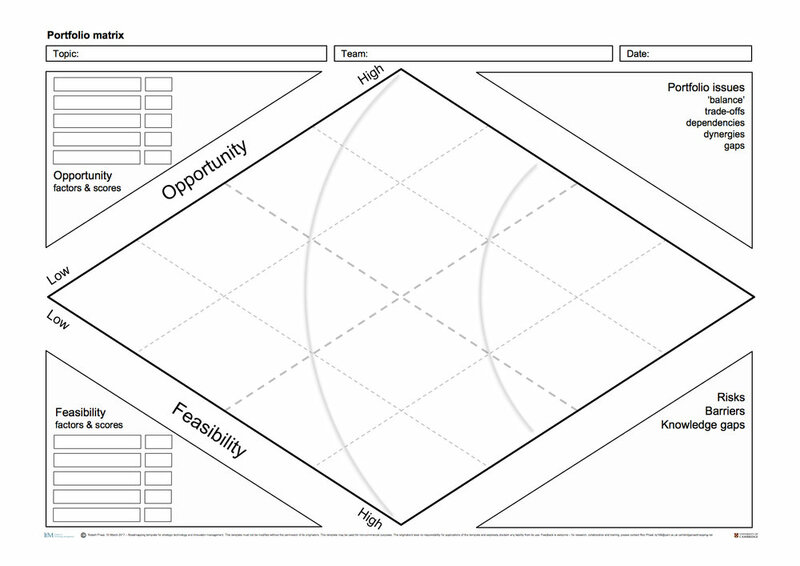 However, as with many strategy frameworks the time dimension is not explicit, which can be addressed through combination with roadmapping, aligning goals with the activities required to achieve them, as illustrated in this experimental template. A form for assessing template utility is provided - feedback on the template and its use is welcome. Please email Rob Phaal if you have any queries. The EFQM (European Foundation for Quality Management) Excellence Model is widely adopted as a primary (quality-oriented) business framework. 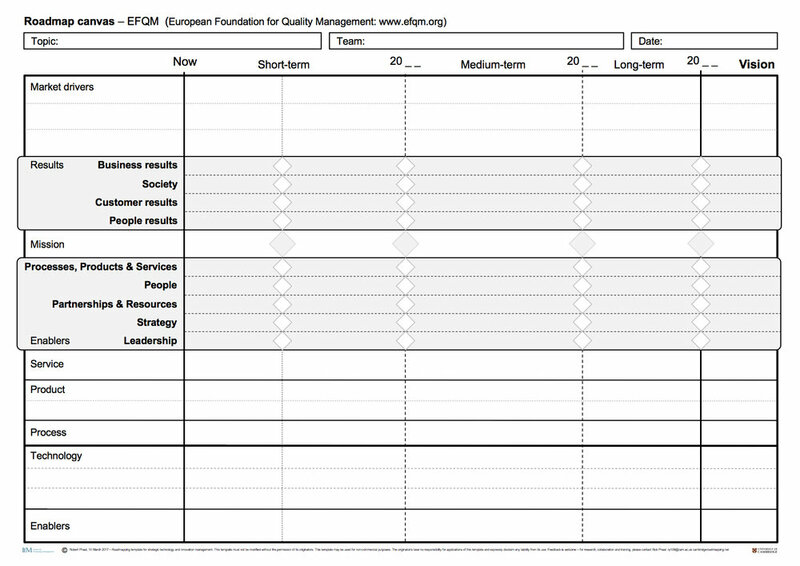 Embedding the EFQM 'enablers' and 'results' criteria within a roadmap architecture can support strategy and continuous improvement through inclusion of time as an explicit dimension, aligning EFQM goals with the activities required to achieve them, as illustrated in this experimental template. A form for assessing template utility is provided - feedback on the template and its use is welcome. Please email Rob Phaal if you have any queries. Michael Porter's 1985 value chain framework is well established, and embedding this within a roadmap structure enables a strategic perspective, aligning value chain goals with the activities required to achieve them, as illustrated in this experimental template. Value and supply chain perspectives often form part of roadmap structures, helping organisations to understand where they sit within the broader industry structure. A form for assessing template utility is provided - feedback on the template and its use is welcome. Please email Rob Phaal if you have any queries. The template below is derived from a series of retrospective maps of technology-intensive industrial emergence (Phaal et al., 2011). The principles and checklist here were subsequently incorporated into a workshop template and process (Routley et al., 2012), and further developed as the 'self-facilitating' template available here. This template is experimental in nature, and a form for assessing template utility is provided - feedback on the template and its use is welcome. Please email Rob Phaal if you have any queries. The 'emergence roadmap' template and process described above (Routley et a., 2012), was designed to complement an earlier 'value roadmap' template and process (Dissel et al., 2009), both of which can be downloaded below. These two templates are designed to be deployed in half-day modules, as a variant of the more general S-Plan 'fast-start' approach for application to early stage technology (push) strategy. Emerging technologies represent both opportunities and threats to the future of the firm, with this template providing a means for capturing key aspects of emerging technologies in a consistent manner. Feedback on the templates and their use is welcome, with a form for both templates available below. Please email Rob Phaal if you have any queries. This template supports the evaluation of emerging technologies, applicable to both firm and sector levels. This template is experimental in nature, developed in collaboration with Dr Letizia Mortara and David Probert. A form for assessing template utility is provided - feedback on the template and its use is welcome. Please email Rob Phaal if you have any queries. Strategy and the implementation of strategy is closely related to change management, the process of roadmapping, and the structure of roadmaps. Some background is available here, with the 'change formula' used to structure the template below. This template is experimental in nature, and a form for assessing template utility is provided - feedback on the template and its use is welcome. Please email Rob Phaal if you have any queries. For change management of any kind, the explicit time dimension that the roadmap framework provides fits naturally, enabling synchronisation of strategy across organisational units. For further information on the ‘change equation’ click here. The core architectural principles of roadmapping can be expressed as a simple 3x3 canvas of phases and transitions, defined by six fundamental strategic questions. Further detail can be added as required, through use. This template is experimental in nature. A form for assessing template utility is provided - feedback on the template and its use is welcome. Please email Rob Phaal if you have any queries. This template focuses on minimum viable product design, supporting strategic alignment between user needs and technological capability through the definition of key deliverables over time. This template is experimental in nature. A form for assessing template utility is provided - feedback on the template and its use is welcome. Please email Rob Phaal if you have any queries. 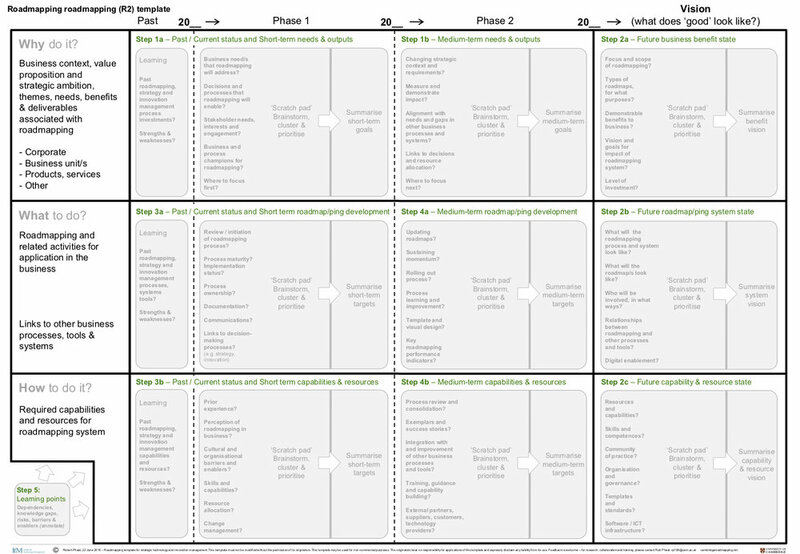 This template is designed to support product-technology roadmapping, along the lines of the original Motorola roadmap exemplar (Willyard & McClees, 1987). This template is experimental in nature. A form for assessing template utility is provided - feedback on the template and its use is welcome. Please email Rob Phaal if you have any queries. Linking grids are very useful for mapping relationships, such as dependencies, tradeoffs and synergies. Linking grids are often used in conjunction with roadmapping, with a common core architecture ensuring the methods fit and scale well together. In this context linking grids are helpful for understanding both market pull (demand side) and technology push (supply side) perceptions, opportunities and gaps. The template can also be used for mapping cross-impact dependences between, for example, technologies - note, the push-pull logic means that such grids are not generally symmetric. This template is experimental in nature. A form for assessing template utility is provided - feedback on the template and its use is welcome. Please email Rob Phaal if you have any queries. The 7 Ps marketing mix framework is widely used, with these templates designed to support strategic marketing & functional alignment. Two similar templates are provided, in collaboration with Dr Serena Flammini, using standard cartesian and polar coordinate systems (i.e. sunshine chart - see template #4). This template is experimental in nature. A form for assessing template utility is provided - feedback on the template and its use is welcome. Please email Rob Phaal if you have any queries. Scenario planning and roadmapping are complementary approaches to long-range strategic planning, even if not often used in conjunction. Where there are significant uncertainties associated with the longer term outlook in strategy, then scenarios can help to explore and understand potential future states, with roadmap connecting / bridging the current to future (and past), allowing potential paths between the two to be explored, mapping and communicated. This template, developed in collaboration with Dr Letiza Mortara, is experimental in nature. A form for assessing template utility is provided - feedback on the template and its use is welcome. Please email Rob Phaal if you have any queries.